Join the premier wilderness lodge in Minnesota and live, work, and play in the Minnesota Northwoods, just steps away from the Boundary Waters and Superior National Forest. At Gunflint Lodge & Outfitters you will provide excellent service and quality to our guests and interact with people who enjoy hospitality and luxury and who love the outdoors! Gunflint is located 43 miles up the Gunflint Trail from Grand Marais, Minnesota. (43 miles from the nearest town!) We are surrounded by over 1 million acres of wilderness in the Superior National Forest. 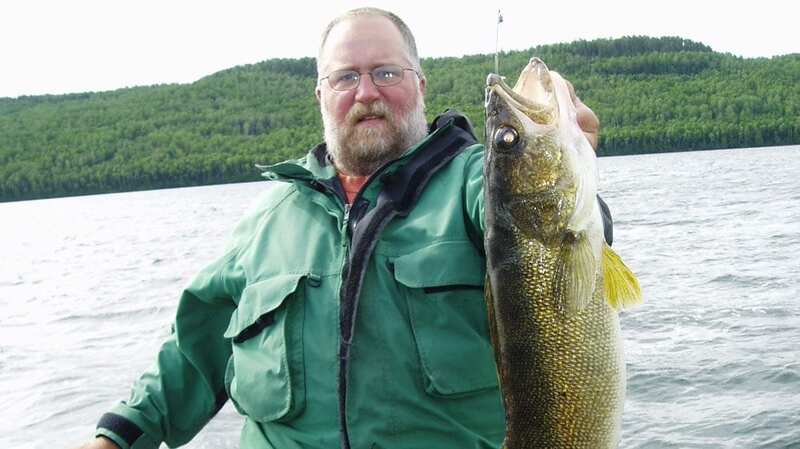 Guests come from all over the world to relax, fish, swim, canoe, and explore in the Northwoods atmosphere. Over the years our guests have come to expect a friendly and helpful staff. They come to have a relaxed vacation and we’re dependent upon our team to see that they have the best time possible. Often this means a little extra work, or time, to help a guest but we feel it’s worth it and you should too! Perhaps the two most important qualities we look for in our team are a cheerful attitude and the willingness to go the extra mile. The schedules are set for 40 hours per week with two consecutive days off. Although you may be hired for a specific position, there are times when you may be called upon to fulfill other job duties. In a resort atmosphere we all pitch in wherever necessary to get the job done. With that in mind, we are looking for applicants who are extremely flexible and like a variety of work. Salaries vary depending on the position being filled, and the previous experience a new employee has. Recreational equipment is available for use at a minimal charge. However, all of our facilities and equipment are for guests’ use first. We offer onsite staff housing with shared 2 and 4 person efficiency apartments, all with a private kitchen and bathroom. Other housing options may include shared apartments and a central bathroom. High speed internet is available in the Lodge and in staff housing. We do not receive any cell phone, TV or radio reception. You may bring your own TV/VCR or CD player if you would like. Varied shifts in charge of the housekeeping team. Responsible for daily operation of housekeeping team including organizing daily workload, supervising cleaning crews, assist cleaning crews with cleaning cabin/main lodge, and conducting cabin checks. Must have ability to take direction from manager, motivate/train others, and lead by example. Looking for a cheerful person with extreme attention to detail. Previous housekeeping and supervisory experience a must! Varied daytime shifts as part of a housekeeping team. Responsibilities include cleaning 24 rental cabins, main lodge guest areas and bathrooms, reporting maintenance issues immediately and able to communicate with guests. As a housekeeper you will take care of the general cleaning of the cabins in the resort. You will use a vacuum cleaner, duster and cleaning detergent. Responsibilities extend to making the bed, changing the bed clothes, dusting the furniture and cleaning kitchens, fireplaces, hot tubs, and bathrooms. You will also walk to cabins to change linens and empty trash for guests. To be a housekeeper at Gunflint, you have to be a self-starter. You must have the ability to work on your own and as part of a team. You will be lifting heavy equipment, moving heavy furniture and you will be on your feet for large parts of your day, and will need to walk between cabins and up and down stairs. Must be detail-oriented, willing to take direction/work well on own and be a team player. Previous housekeeping experience a plus but willing to train. Driver’s license and clean driving record preferred but not required. Must submit to a background check. In this position you will be part of a guest services team where the guest is your top priority. You will be a key component in assuring that we deliver the best possible experience for our guests, since you will be face to face with them on a daily basis. All of their questions and concerns will be directed to you and we want to be able to trust you to represent our resort in these situations. Job duties include guest orientation of our property, review of guest package, reservation processing, data entry, telephone communications, answering guest questions, and any other duties that may be asked of team members. We are seeking an organized, logical, and level-headed person with very good communication skills and a beaming personality. You must have basic typing skills and be computer literate. Must keep clear and comprehensive records of guest room bookings and all billings for accountability and future reference and process. Must check in guests and take deposits and payments. Will be responsible for communicating with guests in person, over the phone, in writing and by email. Excellent written and verbal communication and basic math skills are required. Must attend to all methods of room bookings to ensure that reservations are attended to promptly. Must report issues to housekeeping, maintenance or management to resolve all guests’ issues and ensure their comfort and satisfaction. Varied shifts including morning and evening shifts are required. We are looking for an enthusiastic Bartender/Server to take orders and deliver them to our restaurant guests to provide superior customer service and a memorable dining experience. You will work in close collaboration with colleagues and follow established health and safety standards. Must be a team player! Flexible and willing to work split shifts and/or work in other areas of resort; attention to detail. This position is paid minimum wages plus tips. The tips are significant. We do not guarantee 40 hours per week, but it will be close most of the time. We are looking for an enthusiastic Restaurant Server to take orders and deliver them to our restaurant guests to provide superior customer service and a memorable dining experience. You will work in close collaboration with colleagues and follow established health and safety standards. We are seeking a fulltime Outfitter. In this position, you will have daily contact with our outfitting guests, including families, youth groups, Scout troops, and others, requiring a pleasant attitude and willingness to listen and answer questions about the area. Responsibilities include packing food and equipment; hauling canoes, equipment, and guests to various landings in the area; cleaning returned equipment; providing group meal service, and cleaning bunkhouse and bathrooms. Must be self-motivated team player with valid driver’s license and good driving record and be able to lift canoes and packs weighing up to 70 pounds. Previous experience canoeing the BWCA, portaging skills, cooking, and Leave No Trace camping ethics strongly recommended. Applicants must be 21 years of age or older to meet our insurance requirements for driving vans with passengers. This position is available mid-May through mid-October. We are seeking a part-time Massage Therapist. In this position, you will have daily contact with our Lodge guests, requiring a pleasant attitude. As an integral part of the spa team, our Massage Therapists are knowledgeable and caring professionals, interested in the well-being and personal satisfaction of our guests. They are skilled in the latest massage trends and techniques and have a positive impact on the success of our resort by performing massage and spa treatments for guests and maintaining cleanliness standards for guest comfort and safety and promoting spa and other Lodge services and selling retail products. Must be able to make sound decisions and ensure the privacy of each guest while being sensitive to their needs. Knowledge and ability to lead yoga, yoga hikes, forest bathing, personal training, or other fitness and meditation practices are encouraged. Thorough knowledge of body physiology, anatomy, pressure points. Part-time complementary work may also available at Gunflint Lodge, as well as on-site employee housing at a discounted rate. In the shoulder seasons when business is slower, all staff are invited to work in other departments, to help keep their employment at approximately a 40 hour week. Create memories and experiences for our guests through preparing and providing outdoor meals and activities. You will prepare trail and shore lunches. 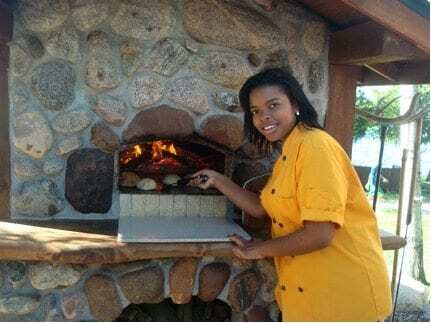 Must be able to cook over an open fire or using a smoker or wood-fire oven in an outdoor environment. Must be able to hike or travel to remote locations. Teamwork as well as individual effort and creative ideas is required. Create memories and experiences for our guests through preparing and providing memorable meals in our resort restaurant. May prepare breakfast, lunch, and/or dinner time meals. Work as part of the kitchen team enabling our restaurant to perform as smoothly and efficiently as possible. You will be expected to help with food preparation, kitchen cleaning, and dishes. Varied shifts working with a team and individually. Must have ability to multi-task when necessary. This position requires a working knowledge of repair work in electric, plumbing, and small construction projects. Knowledge of small engine, marine and snowmobile engine repair strongly recommended. This person will also be doing most maintenance repairs as needed and is responsible for water quality testing on a daily basis. Maintenance positions are responsible for the over-all mechanical repair of the entire 100+ acre property with more than 50 structures. Must have valid driver’s license with good driving record and be able to lift objects weighing up to 70 pounds. This position will require both indoor and outdoor work outdoors in all weather conditions. Knowledge of skid steer equipment, snowmobiles, boats, plow truck, and tractor operation and maintenance a plus. Septic and pool maintenance experience preferred. Prior supervisory or leadership experience preferred. This position requires a person who is self-directed, takes initiative and is able to motivate self and others. Position requires some on-call work and onsite living is preferred but not required. Discounted onsite housing available. Lead our guests on rock climbing adventures on our premises or paddle into the Boundary Waters! You must demonstrate a high level of professional competence and ability to instruct technical skills such as belaying, anchoring, and climbing. Knowledge of climbing equipment and safety practices is essential. Must be punctual and reliable and maintain a high regard for guest safety and overall experience. Must have the ability to relate local knowledge including natural and cultural history. Demonstrate and promote Leave No Trace principles and environmental awareness. Must be safety-conscious and be able to provide leadership, instruction and medical care during an emergency. 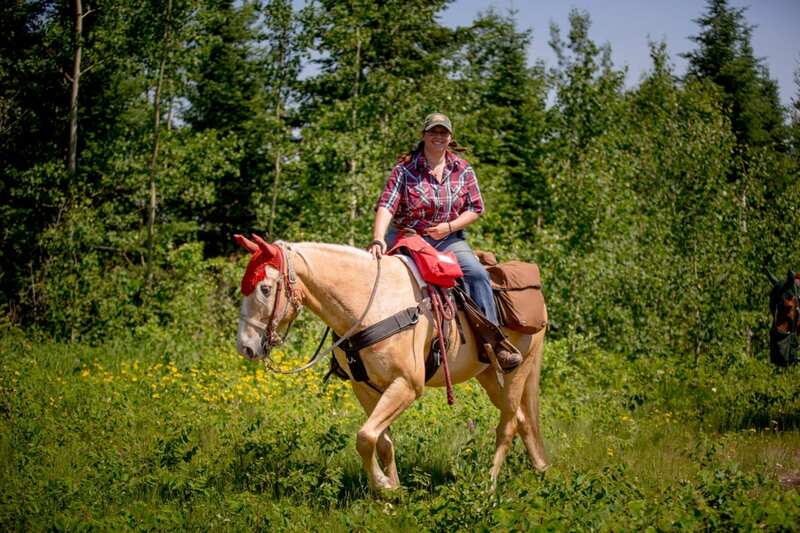 Lead guests on trail rides through the Superior National Forest, providing interpretive information about the area. Daily care of 17 to 19 horses: Feeding, watering, grooming, barn maintenance and repair. Responsible for 1 – 8 guests during 1 – 6 hr long trail rides. Season is May thru Oct so only candidates that can work through Oct will be considered. Must be 21. 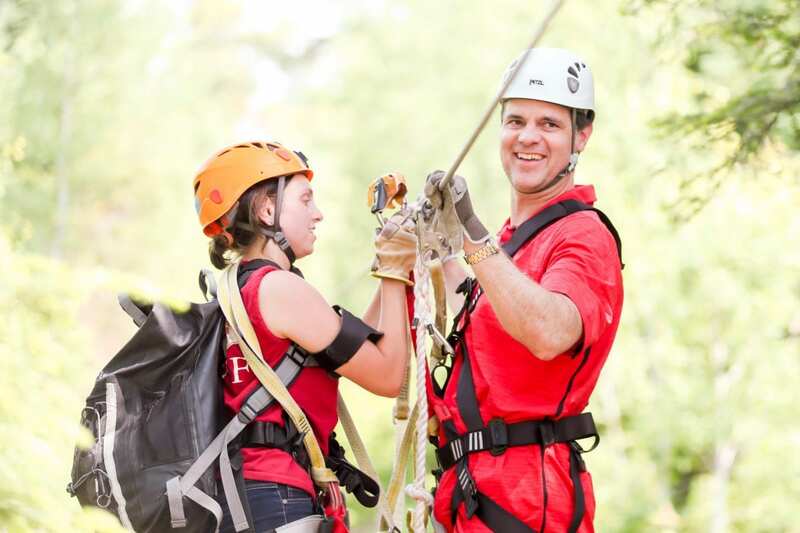 Lead tours of up to 10 guests on our 8 zip tour through the Boreal forest. You will be responsible for the safety and comfort of our guests during this two-hour tour through the trees and will provide interesting and informative facts about the human and natural history of this unique area to enhance guests’ experience and create vacation memories. Many of these positions are available for year round employment unless specifically noted as summer only. Please note – You may be hired for a specific position, but we all work together in a resort atmosphere to cover the responsibilities. At times you may be called upon to do a job other than those specifically outlined. We look for employees who have a wide variety of interests and experiences and are extremely versatile. Walk to work! Minimal wear and tear on your vehicle. Varying free use of water equipment depending on guest needs. 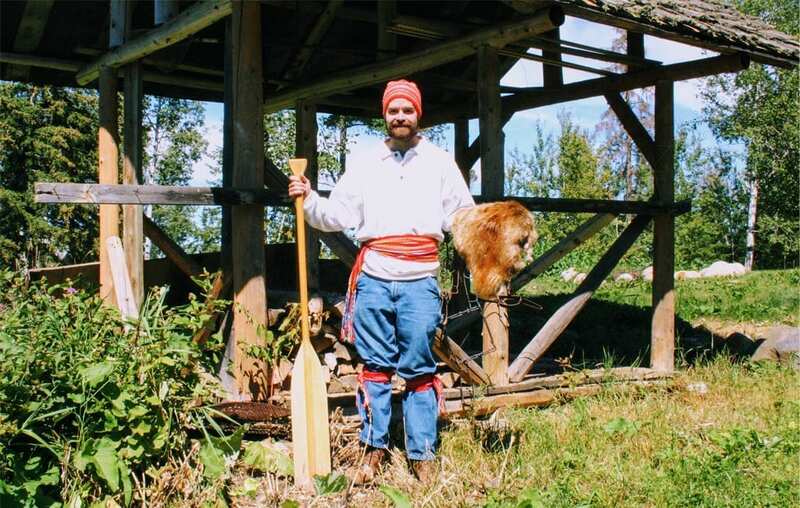 Canoe trips in the Boundary Waters Canoe Area, area hiking trails and fishing. Your parents and siblings can stay in a cabin and receive 25% off rack rates.